Get the Funk Out! : Adrian Paul, star of the famed “Highlander” TV Series and feature films, joins me Monday at 9:15am! Adrian Paul, star of the famed “Highlander” TV Series and feature films, joins me Monday at 9:15am! 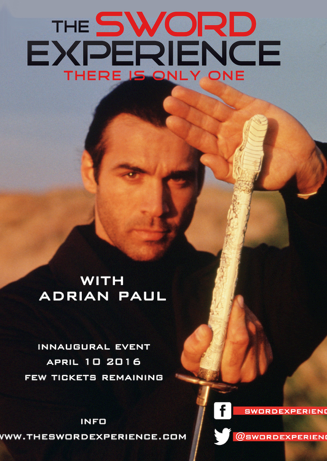 Adrian Paul, star of the famed “Highlander” TV Series and feature films is launching a new endeavor - The Sword Experience on Sunday, April 10 in Temecula. It will be an incredible day for would-be swordsmen and women to hone their sword play and sword technique. This debut “Sword Experience” is being hosted at the stunning Lorimar Winery in Temecula, CA with Chicago, Houston, Minneapolis, the United Kingdom and Stuttgart Germany to follow. With so much of today’s television and film programming including sword play of some measure (“Game of Thrones" to “Deadpool”); not to mention the incredibly active Faire / LARP and Causeplay communities - this is the perfect timing for Adrian to launch his new venture… perhaps in the world of zombies… only machetes will work!